The Spieth America Airmat Floor is a 6.5'x13'x4" portable Air Cushioned Gymnastics or Cheerleading tumbling mat that offers incredible rebound. When filled with air, it provides exceptional cushion and bounce and minimizes micro-trauma. The Air Mat features Air Cushioned Technology which consist of a unique top and bottom heavy duty fabric with strong woven fibers in between which allows the mat to maintain an even equal rebound surface. 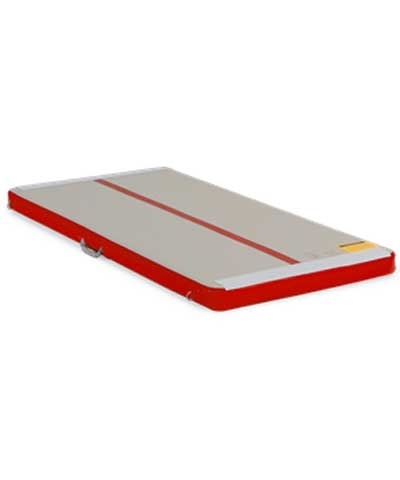 The top of the Airmat features a center red line for straight tumbling and takeoff or beam drills. The side handle and small lightweight size makes it ideal to move around for floor, beam or pit tumbling drills. Includes end D-rings for bungee attachment to other equipment. Not for use on hard surface. Must be used on spring floor, tumbling strip, tumbling mat or carpet bonded foam. Purchase Mini Air Blower S1740115 separately.